Montreal, Part II-B: Bagels, Bakeries, Market & Pastrami. All Before Dinner. Note: Photos were taken by and/or with Don’s camera. The waiter at Au Pied de Cochon accidently knocked mine off the bar during dinner two nights prior. The camera did not survive. There was only one item on our agenda at Kouign Amann, and if the bakery name wasn’t a dead giveaway, you should already know by now. The giant glistening wheel beckoned us step by step, closer, and closer. Whispers of “kouign amann” echoed in the back, a buttery chant. So long as the lady ahead of us didn’t order a wedge, we would be the lucky ones to get the very first cut from the wheel. Perfect timing. All smiles, we pointed and ordered. The bakery girl looked at us and nodded. Nodded left and right. The kouign amann was reserved. Someone reserved the ENTIRE wheel. You see, I’ve never tasted kouign amann my entire life. I’ve read about it on David Lebovitz’s blog. And I’ve turned Robyn’s photo into my desktop background. I’ve dreamed and drooled. But kouign amann and my tongue have never met. And so I thought it would remain that way, seeing as we planned to leave early the next morning. Oh well. But wait! Don suggested. We can come back before crossing the border tomorrow. Even though it was totally out of the way, wrong direction and everything. And he would be driving the whole way back, seven hours or more. But we came back anyways, because butter is delicious and Don is awesome. We returned Sunday morning, 17 hours later, and entered the bakery, fingers crossed. There was no kouign amann in sight, but we asked anyways. The man turned to look in the kitchen the very second the baker slashed down the center of a steaming wheel. First Slice. This time, timing was indeed perfect. We brought the slice, along with a cafe au lait and almond croissant to one of the three tiny tables, soft morning sun shining though glass windows. This kouign amann is one fierce baby. It’s quite easy on the eyes, with sharp cuts and a wonderfully crisp, caramelized exterior. But it’s heavy. HEAVY. It’s heavy in your hands and even heavier in your belly. It’s not so much pastry with a lot of butter as it is butter with a bit of pastry. “Kouign amann” translates directly from Breton as “butter cake”. Nothing lost in translation there. Multiple layers of rich dough, butter generously slipped between in sheets and a tease of salt. Steamy, sweet and filling, perhaps more appropriate shared as an afternoon munch should you disapprove against starting the morning with a butter brick lodged deep in the belly. The best part though, is definitely the brittle crunch of the golden caramelized top – I could easily do without the rest. Sips of the cafe au lait was absolutely necessary with the kouign amann, the hot milky liquid absolutely luscious in the cool morning, simultaneously warming the body and cutting bites of rich butter bathed bites. Surprisingly enough, I enjoyed the almond croissant even more than the kouign amann. Equally heavy, though on a different dimensions, for it managed to be delicate at the same time, with more textural interplay. This croissant leans on the doughy end of the spectrum, though there’s nothing wrong with that, for it makes that wonderful mix of ground almonds, egg and sugar all the more easier to meld and tuck into the innermost layer of dough. A carefree sprinkle of sliced almonds, light syrup to caramelize the top, and we find ourselves wrapped in this blissful mix of almondy crunch, crumbs flying, and soft innards hugging secrets of sweet cream. The pastries get even better! Between sweet scents dancing from the open kitchen and a large sliding glass cabinet teaming with edible options, you’d think it’d be difficult to pick a favourite. But no. It was easy. A bite into the humble maple tart and I was hooked. Settled. The others could not come close. We only ordered the maple tart out of pity – a consolation prize to the lost kouign amann, and besides, it looked rather lonely sitting by itself. Flavour outweighs beauty, and this was a fine example. The shell: simple and buttery, to serve a supporting roll. The real secret hides behind that pale, thin crunchy top. A BATH OF WALNUT SPECKLED MAPLE SYRUP. Oh my goodness, I tremble as I write this. I can recall the first bite, breaking though the crumbly, butter dabbled wall, I crunched though the surface shell not knowing what to expect. But I must have done something, or many things, right in past lives for I was rewarded with a slow flowing pool of pure maple syrup, interrupted only by tiny chunks of toasted walnuts. It was insane. Pure maple syrup on its own, is far from overly sweet, and million miles away from the Aunt Jemima I grew up with. A welcoming golden shade, deep and clear – it tastes honest, if that makes sense. So imagine that syrup, coupled with toasty walnuts, a butter crust and a shattering shell much like the first tap of crème brulee, only skip the custard and replace it with maple syrup. That maple tart made me insanely happy. We could have gone straight back to Manhattan and I would have been perfectly content. With Kouign Amann crumbs in our laps, we didn’t waste a minute and drove down to Le Fromentier for a few more nibbles. A bit excessive? Perhaps. Much fun? Oh yes! Unlike most other restaurants along Laurier Ave, the bakery is set off the street, down a flight of stairs into a deep open space with Le Fromentier on the left, and a charcuterie on the right. The croissant was simply too pretty to pass up, finely browned and near symmetrical. Perhaps the most “perfect” looking croissant I’ve seen to date. A initial crunch yielded intense shattering, but only to meet lifeless innards that hovered between doughy and lifeless – more butter please. Similar could be said for the palmier, pure visual attraction. A touch too soft, and under-sugared. A proper palmier ought to boast speckled of caramelized surface bits. It was far from disappointing, but nothing I’d care to return for, never something craveable, nothing like the Saint Germain plamiers. Twittering between pastry coma and sugar high we returned to the hotel for a early evening nap before 9pm reservations at Kitchen Galerie. Perhaps I would have enjoyed Le Fromentier more if we made it our first stop, before I was seduced by the rich joys of Kouign Amann. Who knows. All I’m certain of is that I should have tucked back a few dozen maple tarts on our car ride back to Manhattan! Dinner post to follow shortly. Montreal, Part II-A: Bagels, Bakeries, Market & Pastrami. All Before Dinner. Note: Photos in this post were taken by and/or with Don’s camera. The waiter at Au Pied de Cochon accidently knocked mine off the bar during dinner the prior night. The camera did not survive. Friday night, post Au Pied de Cochon, we slept a dead sleep. The deep sort of sleep only experienced as a coupled result of midnight fat & foie overkill and a ten hour car ride (not complaining though, Don drove both ways ^-^). Beyond stuffed, I’ve never slept so soundly throughout the night. I was also a bit worried because surely there could be absolutely no more tummy space to hold all the food we had on our agenda. Thank goodness I was wrong. We woke up surprisingly refreshed on Saturday morning, still a little stuffed but nonetheless eager, bagels sparkling on the mind. Fairmount and St. Viateur Bagel shops were on the list and we went only with the former, opting to save room for a half-dozen pastries, sausages, ribs, and pastrami to come. The shop was busy with both bakers and customers moving at rapid speed, the open workspace allowing a glimpse into the kitchen, countless bagels sliding down wooden boards, out of the wood-fired oven and into great big containers already filled with a hundred more. High turnover. We ordered three savouries: onion, garlic and sundried tomato, and a tub Liberté cream cheese, and quickly dashed back to the car, tore open the paper bag for a makeshift table and dug in. The crust on these bagels are marvelous, crisp with a confident shatter, and creamy milky innards, a tad sweet. Just as intense though not as nearly heavy as New York bagels. Next stop, a drive to Marché Jean-Talon for edible ooglings and a few post-bagel snacks. We would return back to this neighborhood for dinner at Kitchen Galerie later that evening. I didn’t find the produce selection to be as impressive as the Union Square Greenmarket back home, but the wide range of meats, fats, livers and terrines were quite memorable. Outside we watched those behind the maple syrup stands pour the syrup straight out of large metal containers onto ice lined tables. It was mother-son team work at this one vendor. The mom would pour and let it rest to freeze for a minute before the son came by to press in wooden tongue depressors, turning the syrup into glassy maple lollipops. …and a bison rib – tender, though with a glaze too sweet for my liking. We sat on the bench outside, under the sun in the warm weather (how I take this for granted in Hawai’i! ), quietly munching away as morning shoppers passed. We followed into the afternoon with visits to Kouign Amann and Le Fromentier for cakes, croissants, cookies and pies. But I’ll save the bakery visits for the next post and let this post be the savoury memories of the day. The line in front of Schwatz’s was long when we first passed it in the morning, and even longer at 4pm in the afternoon. I’ve never been a big pastrami eater, or a real meat eater for that matter. That is, until I met Don, and now it seems all I do is crave hot savoury, dripping hunks of meat at every hour of the day. Despite the crowds, the line moved quickly and it was our turn in but a few minutes. “I don’t want my own sandwich,” I said, still full from our morning adventures. Don asked if I was sure, and yes, I was. I was sure I was sure. Hah. He placed the order for the sandwich and I thought that was it, so I turned my focus away to the interior of the delicatessen packed to the brims with midday diners and countless pastrami sandwiches, enormous slabs of grilled beef livers and plates of fries, dainty in comparison. But then I heard his voice again – ordering more? “…and a whole pastrami, extra fatty.” He looked over at me, “we can share.” The whole pepper-crusted pastrami made it safely back to the city with us, the savoury fat seeping though a double wrap of butcher paper. Marvelous. Don and I left the city at two in the afternoon and arrived in Montreal near midnight. Through the Holland Tunnel, we sped in and out New Jersey, and back into New York, heading upstate, a nighttime crawl though dark roads of the Adirondacks and past Lake George. We missed our reservation but luckily enough dashed in the doors a good ten minutes before the kitchen closed. He parked around the corner and we slipped into the doors from the chilly air. Inside, minutes till midnight, the dimly lit Au Pied de Cochon bustled with late night diners. I caught murmurs of French and stole glances at foie gras loaded plates with every turn. Seated at the bar we were handed menus taunting an abundance of foie in a dizzying array of preparations, duck in a can, tripes with house-made chorizo, and stuffed pied de cochon with foie gras. Orders were placed in minutes, our tummies growling in anticipation. Five dishes: three involved foie gras, and three were deep fried. None were vegetarian. Midnight decadence is the only way to go. The bread arrived shortly after, crackling crusty edges, wide cut for lavish smears of mayo. OH MY GOD THE MAYO WAS SO GOOD. I tried to be polite, using my knife to swoosh out the creamy goodness. But a few swooshs in, I was completely taken over and starting dunking the bread into the jar. MUST SOP UP ALL THE MAYO. I swear, if no one were looking I would have not hesitated to simply lick the jar. Later, when the waiter brought by a dish of butter would we find out that the mayo was intended for the salt cod fritters, not the bread. Oh well. It was delicious. The salt cod fritters arrived in due time, five to an order. Piping hot, indeed a wonderful sin to the lips. The deep brown cracking surface broke to reveal a savoury mass with just a bare hint of peppery heat, a gust of steam before deep dunks into the pot of mayo. OH. The mayo. Oh man. Next, sweet thin slices of roasted piglet, and whitefish salad. This was the lightest dish of the night, the “salad” course if you will. Foie Gras Cromesquis came in pairs, deceivingly neat fried cubes of fatty goodness. The waiter warned us to first let it cool, then to pop in your mouth at once. He tapped his lips, “keep them closed.” And so we did, letting a bomb of liquidfied foie gras explode in our mouths as we broke through the crisp shells. The most decadent dish came at the very end. The word “decadent” doesn’t do this justice. It was like crazyrichbutterygoingtokillyou kind of extravagant. I don’t think they expect anyone to finish this dish. Or I hope not… Okay. So imagine puff pastry. And then add ten million additional sticks of butter folded into each layer. And then more butter on top. And butter drizzled all over! Maybe another pat here and there for good measure. Then. Potatoes. Potatoes in bite-sizes pieces, cut a quarter-inch thick. Sautéed. Sautéed in what? Butter of course. LOTS of butter! Then. A sweet element: onions! Onion marmalade. Prepared how? Why with more butter, dare you ask!! While we’re at it, pile on house-made blood sausage then top off with foie. Foie gras all over! Let the heat melt the supple liver over the sausages like little top hats of fat. Oh fat. I eagerly cut a wedge, foie dripping in near sick excess. Was this decadent or disgusting or simply absurd? I could no longer tell. But I was quite nauseated by this point. I took a taste of all in the first bite, the pastry hit me first. So buttery it hurt. It was painful to taste all that butter in a bite after the four fat and foie laden dishes preceding the tart. The potatoes bubbled butter. Buttered laced the marmalade. And by then, I could no longer appreciate the boudin, which Don assured me was delicious, for my mouth was coated in fat and my stomach in pain. And about one-sixth of the pie in, my heart started to hurt a bit. Like ouch. And it became a bit hard to breath. I slowed down. Took a sip of the room temperature water. But oh. Oh yuck. Water would not do. I eyed Don’s beer. He gets the message and passes it over. Oh yes, the beer was exactly what I need, crisp, cutting through the fat, chilly down my throat..Perfect. That was dessert. Defeated by a circus of food, we surrendered, half the boudin tart untouched, and dangled into the night, at once sleepy and toasty from inside out, thanks to a newly formed layer of body fat. Blame it on murder by foie, blood sausages, mayo by the jar, buttered potatoes on an even more buttery base, and a triple kill of fried dishes. Would I want to back? No, no, noooo. Am I glad we went? Oh yes. This one, very decadent visit, is enough. …Don stopped by in the morning and we speed up to Arthur Avenue. Objective: sandwiches for lunch. We arrived to the Bronx from the Lower East Side in less than 30 minutes, no time wasted. “How much do you think we need?” he asked. And so three pounds it was, three pounds of luscious fresh mozzarella softer than a baby’s bottom, cotton balls of milky sweet heaven twisted just minutes before by the two fellows pictured above. Mozzarella safely in tow – we made twenty steps up the street, turned to the left, walked one block over and straight into the warm comfort of the Madonia Brothers Bakery. Endless loaves of bread up ahead, an enormous case devoted to biscotti, and rings and rings of prosciutto bread to our right. Two savoury prosciutto studded rings for snacking and a loaf for the sandwich. And then, “how about cannoli?” he asked. And of course, one should never be silly enough to deny cannoli. Filled to order. So four it was. Two to eat the second we got in the car – while the shell was crisp and crackled into the soft, cool and sweet chocolate chip speckled cream. Two saved for lunch. A pause in at the butcher next door for guanciale, and just as quickly as we arrived, we left, speeding back down to the city. We dashed into the apartment, eager to run back out before the Greenmarket would be flooded with Saturday shoppers, and paused only long enough to open up the container of mozzarella, and observe the plush white knobs before plucking up the first of many and gently easing it apart. Oh, gorgeous. Supple and sweet like you’d never think to imagine. We strung it apart, splitting it down the middle. And then another. And another. And over and over again until one of us, I cannot remember who, suggest we stop before there would be none left for the sandwiches. Oh yes, the sandwiches, how silly to have almost forgotten! A morning stroll to the Greenmarket for Ronnybrook heavy cream, tomatoes and plenty of basil. The soon-to-be sandwiches demanded fresh pesto. And so he toasted the pine nuts. He chopped the garlic, made magic with the basil, aged parmesan and a dash of salt. And I did what I do best when good food is around. I tasted. I tasted the pesto. First a dabble. Then a bit more. Followed by the spoonful. We moved onto nibbles of prosciutto, just a little more mozzarella and oh heck, why not a little snack. Yet another bocconcini unraveled, a vibrant smear of pesto and sliver of sweet roasted pepper. All wrapped in paper thin prosciutto and popped in the mouth just so. Who would ever, ever desire to eat out again? But there was a plan. And there was a mission. And though there were delicious distractions, we got to work. Bread sliced opened, sherry vinegar, a never ending stream of mozzarella, untangled and layered upon with prosciutto and the bright red peppers. Pesto on top. Pesto on bottom. Cracked pepper. Maldon salt. And we were good to go. Almost. A mason jar filled with Don’s cold brewed Counter Culture toddy and roasted almond milk – spring dessert and drink tied into one, the most delicious liquid I’ve experienced. And then we set off to watch the 7th annual NYURI performance in Washington Square Park. More photos from the event on Flickr. The picnic spread: sandwiches, cannolis, and coffee. We met Sofia at the park, where she proceeded to share crisp almond tuiles from Oro Bakery. Ahhhh, the world is filled with too much good food. Awesome spring-time weather also doesn’t hurt. Flickr Set for the day. Don’s Cocktails = Maple + Bacon + Bourbon. Palmiers: Eaten & Baked. Momofuku’s Pistachios & Malted Ice. I. Bacon in liquids? Oh goodness, yes, in cocktails with a shimmy of maple syrup! Don’s concocting delicious magic over at PDT with his Bacon-Infused Old Fashioned. Sounds intriguing? Check here for the video release – find it also in print in this week’s issue of New York Magazine. II. A taste of the palmier cookies at Gramercy Tavern last weekend quickly brought back to mind just how much I love these cookies. Saint Germain back home in Hawai’i bakes my favourite palmiers – palm sized and lightly sweet with a deft crunch. Don enjoyed them so much that I baked up a batch later that evening, which were quickly devoured. Note to self: must seek out more bakeries in the city offering palmiers. Photo by Don. @ Momofuku Ssam. III. 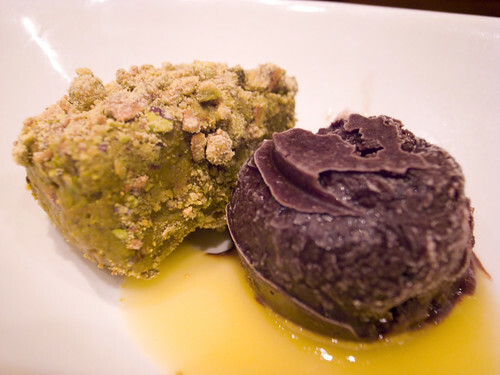 This dessert pictured above from Momofuku Ssam haunts me in drool-worthy dreams. A three-part creation of pistachio croustiallant, pineapple, and malted ice milk makes for texturally intriguing bites. Icy shards of malted chocolate, pineapple delivered in a chilly tang, coupled with the nutty crackle of croustiallant – ground pistachios braided into every spoonful.